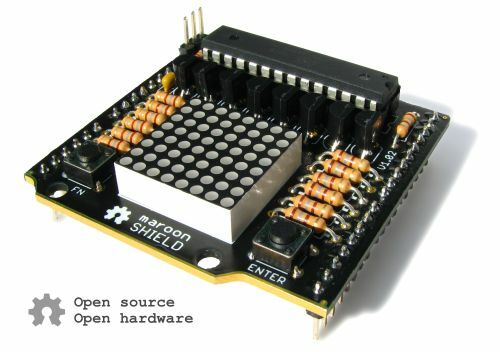 The Arduino compatible maroon SHIELD offers an 8×8 LED-matrix-display in conjunction with a microcontroller (Atmel ATmega88A) and two input buttons. 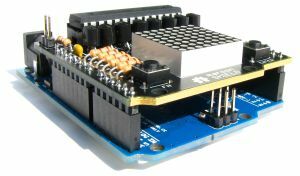 Control is easy to use: Text and grafics can simply be send over the serial interface. 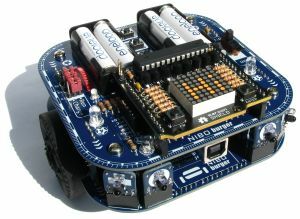 The construction kit is Open-Source and Open-Hardware and can be used freely. There are no bounds to imagination: Lightning effects by night and day, scrolling text, display of values, funny animations etc. 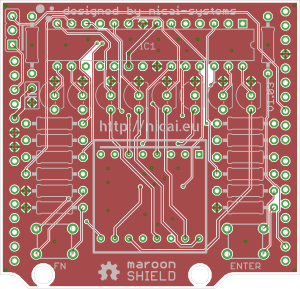 As an Open Hardware projekt, the details about the maroon SHIELD are complete open and everybody can use it without licensing costs. 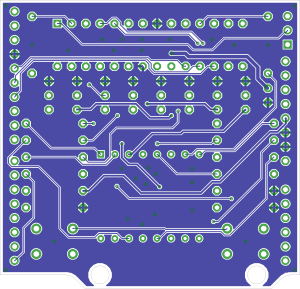 The schematic, the layout, the used components and the interfaces are accessible for download together with the sourcecode of the firmware in the SVN Repository on the ↷ Sourceforge-website.